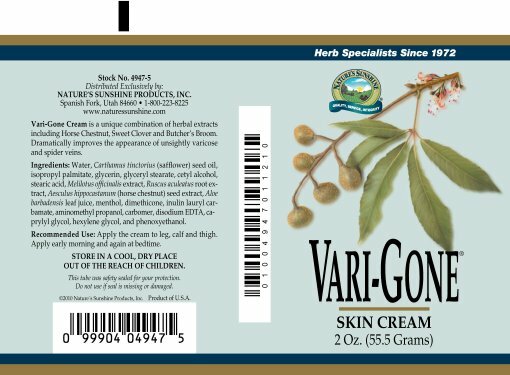 Nature’s Sunshine Vari-Gone Cream® combines horse chestnut, butcher’s broom, aloe vera, and yellow sweet clover into a cream that improves varicose vein appearance. The formula works to hydrate and tone the skin in addition to assisting in decreasing unsightly varicose and spider veins. 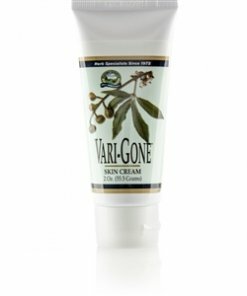 When used regularly, Vari-Gone Cream increases the softness of the skin and adds to overall skin health. 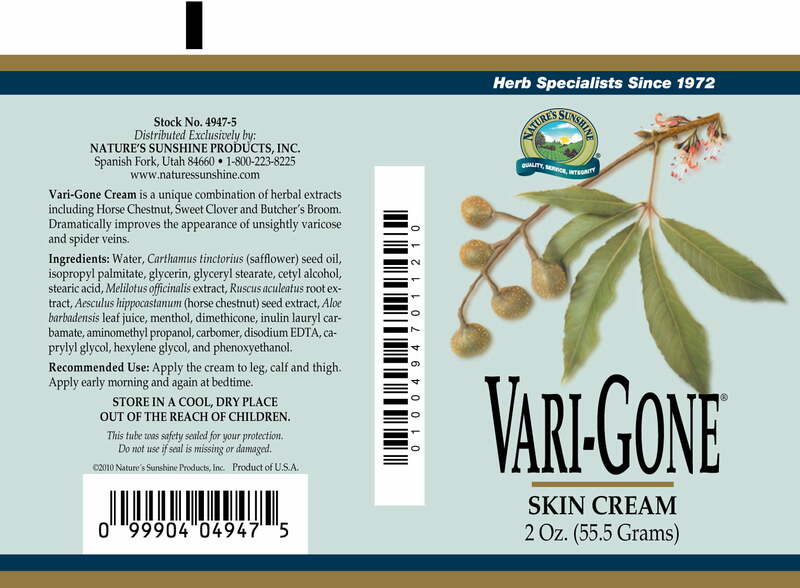 NOTE: If taken internally, certain ingredients in Vari-Gone Cream may thin the blood. Consult a physician before using this product in conjunction with prescription anti-coagulant medications. Instructions: Apply the cream to leg, calf, and thigh. Apply early morning and again at bedtime. Water, Carthamus tinctorius (safflower) oil, isopropyl palmitate, glycerin, glyceryl stearate, stearic acid, cetyl alcohol, Melilotus officinalis (yellow sweetclover) extract, Ruscus aculeatus (butcher's broom) extract, sodium stearoyl lactylate, Aloe barbadensis (aloe vera) juice, Aesculus hippocastanum (horse chestnut) extract, menthol, dimethicone, polysorbate 20, triethanolamine, carbomer, disodium EDTA, phenoxyethanol, methylparaben, ethylparaben, propylparaben, butylparaben, and isobutylparaben.